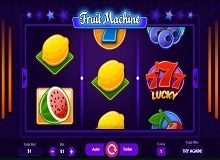 The Fruit Machine casino slot online is one of the simplest video betting games that you’ll come across online. If you are a fan of classic, traditional slots, you are definitely going to love this Twinoplay machine. The slot’s gameplay is very simple and it doesn’t have any complex features whatsoever. 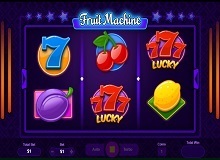 Those who are looking for modern games with extra rounds and bonuses won’t be very happy with the Fruit Machine slot. However, beginners and the fans of traditional betting will be happy to spin the reels of this machine. This casino online slot features a very plain structure with three reels and only one payline. As such, the game is pretty straightforward and easy to play, especially for those who don’t have any experience in online betting. Keep on reading to learn more about the betting requirements created by Twinoplay, as well as tips and cheats for scoring good combos in this game! 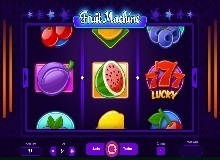 The Fruit Machine game offers a few options when it comes to customizing your bet. If you choose to play Fruit Machine for real money, you will have to set a wager ranging anywhere from 0.50 to 20 per coin. You can place one, two, or three coins at stake per spin. Judging by these betting limitations, this slot is not the best choice for high rollers and more serious players. On the other hand, if you are looking for a relaxing game to spin some reels and have fun, this might be a good opportunity to do so. The whole process is very simple and takes less than a minute to get done. Besides, you can always use the autoplay button to let the reels spin on their own. The autoplay feature can spin the reels up to 1000 rounds. You can also use the turbo function to speed up the reels if you want the game to run a bit faster. 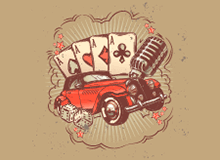 There are only a few ways to win money while spinning the reels here. Unfortunately, this is not one of those modern games where players can benefit from bonus rounds mini-games and extra features. You won’t even find any Fruit Machine free spins in this case. The objective in this game is to match three identical symbols, which results in a payout. The highest paying symbol is the lucky seven and it is also the most important icon on the reels. You can win money by landing only one lucky seven, while all three lucky seven symbols will bring you the highest payout. Therefore, one lucky seven icon will reward you with the amount you placed as a bet. Two lucky sevens are worth 5x your initial stake, whereas all three lucky seven icons will reward you with a multiplier of 1500x. Different symbols will bring you different rewards, ranging from a multiplier of 15x all the way up to 100x. Therefore, three cherries are worth 15x your wager, three lemons will bring you a multiplier of 20x, while three grapes are worth 30x your initial wager. The plums and watermelons are also worth quite a lot, as they bring multipliers of 50 and 100x your bet. Other than ordinary symbol combinations, there are no additional bonuses or features. However, what’s interesting about this traditional game is that your prizes can increase if you put up more than one coin. If you play Fruit Machine casino slot online, don’t forget to place at least two or three coins on the line. Your prize will be doubled if you bet two coins and tripled if you bet the maximum amount of three coins. Even though the Fruit Machine casino slot online is one of the most basic online betting games, it can be fun for beginners and players who like to keep things safe. It is very simple to play and easy to understand since it doesn’t have any bonuses or complex features. This game is quite limiting in the sense that you can only win money by matching three symbols or landing Lucky Sevens. However, you can double or even triple your winnings if you bet two or three coins. Keep in mind that the coin size ranges from 0.50 to 20, which gives you plenty of space to customize your bets. Other great features of the slot include the autoplay button and the turbo function that you can use to speed up the reels and make the gaming experience faster. If you give the slot a spin, don’t forget to bet double or triple!